Chocolate Peppermint Creams for sale. Buy online at Zingerman's Mail Order. Gourmet Gifts. Food Gifts. I took these home to do some "research" and hit a snag. The whole box disappeared from my office. I found it hours later, hidden under my seven-year-old daughter’s pillow. Half of the patties were gone. “I need these for work!” I said. She looked at me, then back at the box of chocolates. “Well, can I have them when you’re done?” she asked. I don’t blame her. These are peppermint creams with a plus. 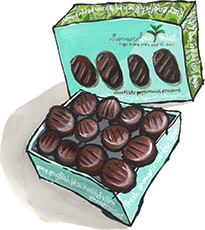 They're made by Summerdown, which also happens to be the third-generation farm in Hampshire, in the UK, that grows the Black Mitcham peppermint that flavors the silky cream inside. Black Mitcham is an heirloom peppermint that was common in England a century ago, but rare today. The mint is so fresh and vibrant within the dark chocolate coating that the candies practically hum. Twelve patties per box means there might almost be enough that you're willing to share. "Those Summerdown Mint chocolate peppermint creams? Opened them last night, and from someone whose favorite childhood candies were York Patties and Junior Mints, and now rarely eats sweets, two words: Life. Changing."